Pet Shop Boys ‎– Did You See Me Coming? 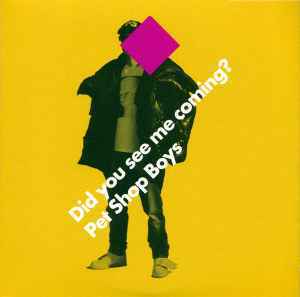 Pet Shop Boys release their new single "Did you see me coming?" on Parlophone Records on June 1st. The track is the second to be taken from the top 5 album 'Yes'. The formats of "Did you see me coming?" feature brand new tracks "After the event", "The former enfant terrible" and "Up and down" which do not feature on the album. There is also a new mix of album track "The way it used to be" by Richard X. The Brits medley, produced by Stuart Price, which was originally performed in February when Pet Shop Boys received the award for Outstanding Contribution to Music, is also released in one of the digital bundles due to popular demand. A missed opportunity, that's what this release is about. Both of these songs deserved decent remixes, the kind of remixes that were made for "Love Etc." the previous single. But there is nothing here that deserves attention. PSB tend to consider their 'Possibly More' version of "Did You See Coming?" as one of their finest remix. Well, it is well known that they're not the best judges regarding their body of work. It's uninspired and boring to say the least. The production is un-impressive and those extra lyrics just ruin the original song (they did it again with "Fluorescent" achieving an even worse result). The Unicorn Kid version in a Super Mario video game music style is funny to listen to once but no more than that. And the Richard X take on "The Way It Used To Be" although not bad in itself doesn't add anything to the song and doesn't meet expectations that such a good song creates. The Richard X mix of "The Way It Used to Be" is great.